His bag has gone missing. Not the frivolous one that includes unnecessary stuff like clothes or toiletries. The real important items are AWOL – like backup batteries and chargers. Also his laptop. For 45-year old software architect Jaman Burton, he’s not worried about getting his equipment back for some work project, he’s got content to create for his rapidly-rising-in-popularity poker vlog, The Drawing Dead. Now, here he is in the mecca for poker, Las Vegas, and the airline is informing him that just about all of the equipment he’s going to need to document his latest adventures in poker is nowhere to be found. One look at the scowl on Burton’s face and you can tell – he’s not happy. Burton, who hails from St. Louis, MO is a part-time poker player, full-time enthusiast and the star/director/editor of one of poker’s fastest growing vlogs on the internet. With a style all his own, he takes his viewers inside his life and inside his sessions giving viewers a brand new way to look at the game. And while he may be on the cutting edge of poker’s new media frontier, he hasn’t always been at the forefront of poker. As poker exploded into the mainstream, Burton, the bowler, recalls that he still didn’t even know basic hand rankings. It wasn’t until years later when ESPN was airing a marathon of the World Series of Poker Main Event did it catch Burton’s eye. But once it did, he was instantly hooked. “I was like, that game looks easy…I’m going to try this,” Burton recalls, chuckling at the notion of his younger self. Burton dove right in and cut his teeth playing micro stakes by logging into online poker site UltimateBet while taking in strategy tips from Phil Gordon’s Little Green Book. ‘Now’ is indeed a different time for Burton. After years of doubling down his efforts to learn the game, studying more than playing, he began to find stability in Missouri’s live poker scene. Then, less than a year ago, his poker journey would take an interesting turn. “Look him up on YouTube,” Priscilla directed. Burton did. Right then and there at the table. He pulled up one video. Then another. Burton, like when he had accidentally caught the WSOP on ESPN, was instantly hooked. 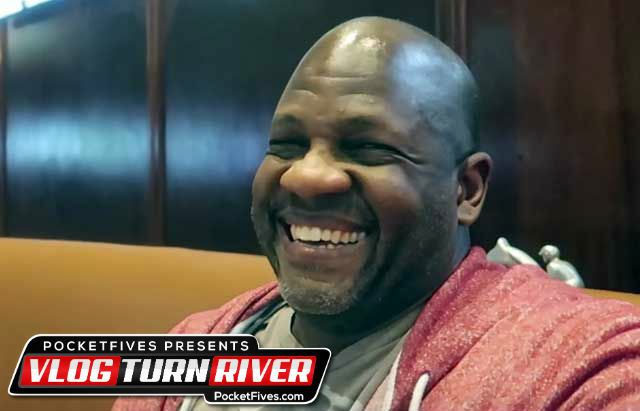 Jaman engaged the veteran poker vlogger Tim ‘TheTrooper97’ Watts for a brief conversation and after wishing each other good luck, Jaman went home and watched even more. Undeterred, Jaman decided to give it a second shot, this time with a poker session. He took his phone, his old Mac and iMovie and began vlogging his poker sessions. But this time he didn’t upload them, he shared them only with his friends, each time taking in feedback and picking up new tips and tricks. Now, as he’s quickly approaching his 100th video, Burton has carved out a style all his own. It’s not the hand analysis style of Andrew Neeme, nor is it the man about town attitude of his friend Watts. Burton is crafting an entertaining middle ground that brings together what he loves about both of those vloggers as well as his poker roots. As a super fan of High Stakes Poker, the TV show, Burton sets out to not just emulate some of the styles of the show in his on-screen graphics but, more importantly, the flow of the show itself. He does this by throwing on his trademark “The Drawing Dead” opening, which mirrors the opening of the popular zombie show of a similar name. With the eye of a film buff, he interjects short movie clips as memes, helping him emote, while film reel transitions show off hand histories as they happen. All the while Burton’s own direct to camera commentary is performed with a kind of stoical poker-face which thinly masks his genuinely jovial nature and love of poker. His formula is working, as in early February Burton eclipsed 10,000 subscribers to his YouTube channel only to see it surpass 12,000 two weeks later. Currently with no end in sight to the documenting of his journey, Burton’s finding that what he currently hopes the future holds is not what he once was looking for when it comes to poker. So what does he want for the future of his vlog? “I just want to get better. This is very personal to me. Burton’s in a much better mood now. He heads out onto the Las Vegas strip with the news that his equipment bag has been located and will be returned shortly. He holds up his handheld camera and matter-of-factly shares his next moves – a friendly game at the Westgate, a trip to the Bellagio, perhaps a delightful piece of cheesecake. After a long grueling day, his viewers watch on he shuts off the camera only to get up the next day, to start filming again and to get back to work on getting just a little bit better.